Convert any video file (AVI, MPEG, MPG, MKV, WMV, etc) to high quality MP3 file. Use this software to extract the audio from any video file, especially from music videos. Convert any video format (such as AVI, MPG, MPEG, MKV, MOV, WMV, etc) to iPod-compatible video. Supports iPod 5G, Classic, Nano, Touch, 4th and 5th generation. 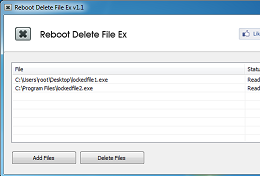 Use Reboot Delete File Ex to carefully delete a file (or multiple files) on the next reboot, without any risk to crash the system. Delete files in use by other applications and locked files. Extract the audio from any video format (such as AVI, MPG, MPEG, MKV, MOV, WMV, etc) and convert it to MP3 format. Supports LAMEMP3 Insane Quality (320 Kbit/s, 48 kHz) and much more. Quickly optimize any MP3 audio file to an insane quality: 320 Kbit/s, 48 kHz, Stereo. Play these new super high quality MP3 files in your preferred iPod, iPhone, or any other MP3 player.